Mushrooms should be cooked the day you buy. fresh mushrooms are good to cook. cleaning mushroom is very important. i normally wash each and every mushroom by scratching the dirt. then i wipe the mushrooms with a clean cloth before chopping it. If you are seeing the basmati rice grains distinct and apart, the credit goes to Rak's kitchen. she was so kind to help me with suggesting good basmati rice and the water level for it. Thanks Raks! Measure Basmati rice. Rinse the rice and soak in water for about 20 minutes. use the same measuring cup to measure water. the ratio for rice and water is 1 : 1 & 1/2. so measure 4 and half cups of water and keep aside. Wash the Mushrooms thoroughly and wipe them with a clean cloth. chop the mushroom into thin strips and set aside. Chop the onions into thin slices. slit the green chillies. chop the tomatoes into 4 parts and grind into a smooth tomato puree. Wash the mint and coriander leaves thoroughly and keep aside. Heat a wide bottomed pressure cooker. add oil and ghee to it. add fennel, cinnamon, cloves, bay leaf, star anise and maratti mokku. Add finely sliced onions and saute it well for at least 2 minutes in medium flame. then add sliced green chillies and the mint and corriander leaves. Add ginger garlic paste and saute till the raw smell leaves. now add the Mushrooms and saute till they shrink and leave little bit of water. mushroom takes 2-3 minutes to cook. Then add Tomato puree and green peas and give a good mix. let the mix stand in medium flame for about 2 minutes. Now add chilli powder, garam masala, salt to taste and mix well. Add measured 4 and half cup's of water, let it boil and then add the soaked and drained basmati rice. add lemon juice and mix. Close the pressure cooker with its lid and do not put weight on it. let the steam escape. let the flame be in medium for exactly 12 minutes. after 12 minutes switch off the flame and let the cooker rest for 5 minutes before opening it. Serve the biryani with onion or cucumber raita. * if you are a food blogger, put the hot biryani on a fancy bowl, click pictures of the hot biryani on different angles with different props till you are satisfied and by the time you click, family leaves you and finishes off the hot biryani! finally you got to eat the cooled biryani with a high level of satisfaction indeed!! 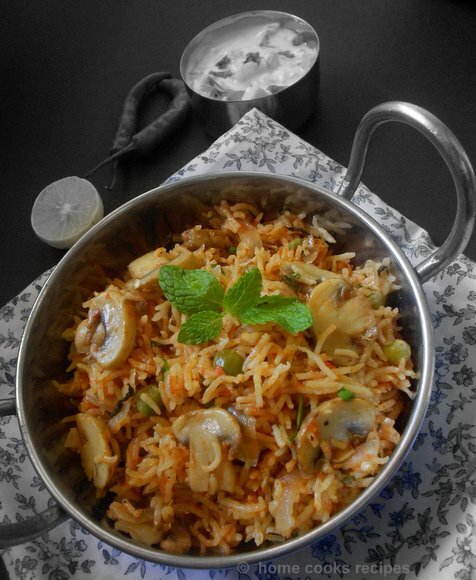 Simply yummy and delicious looking mushroom biriyani. Excellent preparation. so amazing and mouthwatering recipe. Looks flavourful and yummy...Love the idea of adding peas.Love the pics too Lavi! 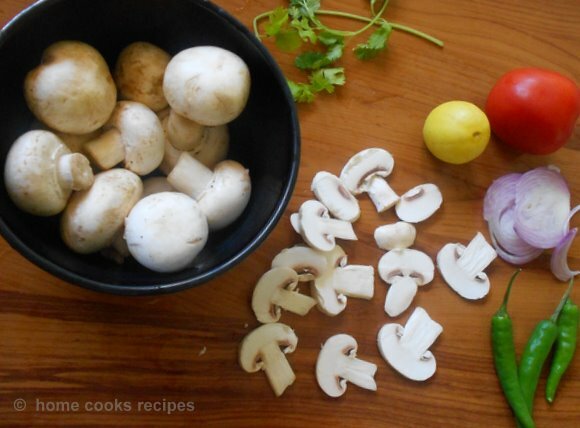 mushrooms r my favourite in any curry, the biryani looks very tempting tasty and awesome. Nice recipe lavi, love your ingredient pic inside the box :) thanks for sharing. Very delicious briyani, after becoming a food blogger, half the time end up the same way as you have mentioned, following U.. Beautifully done and very nicely clicked. Bookmarked. will sure try sometime !! Any thing that comes under food can’t give you the feeling of active, alive, fresh or in other words brings back the spark. So if any food brings you all these then that is the real food and for this the chef has to do the magic, so thank you for the magic. Really your recipe blog is very nice. Hi! I tried this recipe. My first time trying biryani. It came out well. My family liked it a lot. Thanks so much for the recipe. I have tried few of your other recipes too(panneer butter masala, kaju katli to name a few).Very tasty. Like your blog a lot. 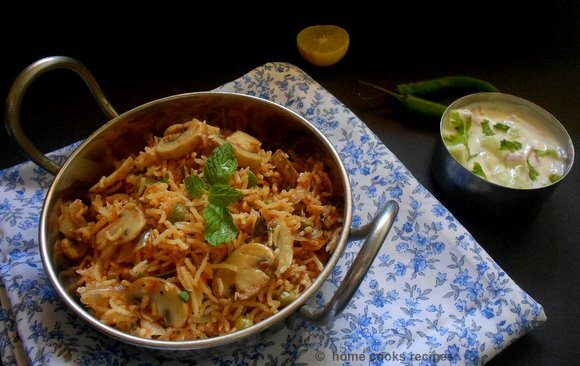 we are in love with the south indian mushroom biryani. on our recent trip to coimbatore we used to have mushroom biryani at sadhguru jaggi vasudev's ashram mostly for lunch. we got so addicted to it that now i make the biryani twice a week.